For some it is a word that invokes fear, as nothing is worse than being separated from the hectic flow of civilization. For some a city made up of millions of people and towering skyscrapers is something to strive for, an ideal place to reside. Not me. The tranquility on display during the film Spring, Summer, Fall, Winter...and Spring filled me with envy. The picturesque setting was like something I would dream of at night, only to wake up and wish the sandman could take me right back the next time I closed my eyes. In the film, a tiny house floats on a peaceful, secluded lake, and inside this Buddhist monastery is an elder monk and his young apprentice. 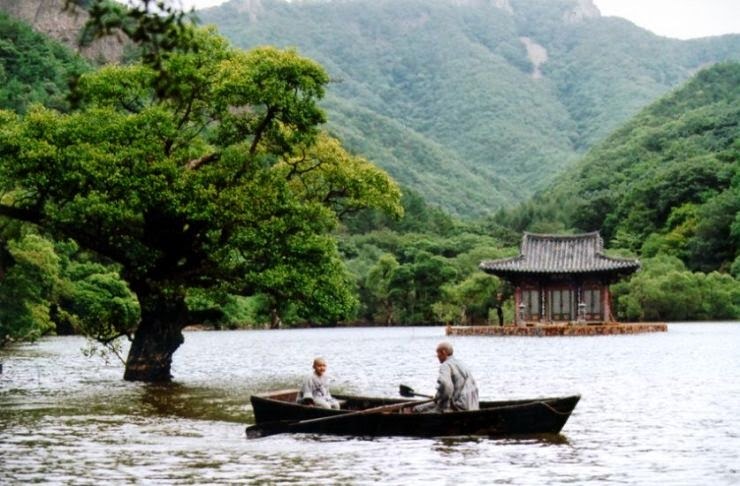 The story is broken up by seasons, or rather sections of the life of the young monk in training, and it is told in a shockingly peaceful, eloquent manner considering director Kim Ki-duk is widely known for telling violent stories. I found it impossible not to be relaxed by the atmosphere and flow of this film, which is both a good and a bad thing. Good because it perfectly suited the intended tone and the lifestyle of the characters, bad because my first attempt at viewing Spring, Summer, Fall, Winter...and Spring resulted in me falling asleep halfway through and waking up on the couch with neck pain. It isn't that the film is boring, it is anything but, but its methodical nature and smooth style of storytelling plays almost like a sound machine intended on making us drift away on the lake with them. Spring, Summer, Fall, Winter...and Spring is beautiful, plain and simple. It's gorgeous to look at and it is a fascinating way to portray what is essentially the circle of life. I may have fallen asleep the first night, but I couldn't wait to pick it up where I left off when I awoke.